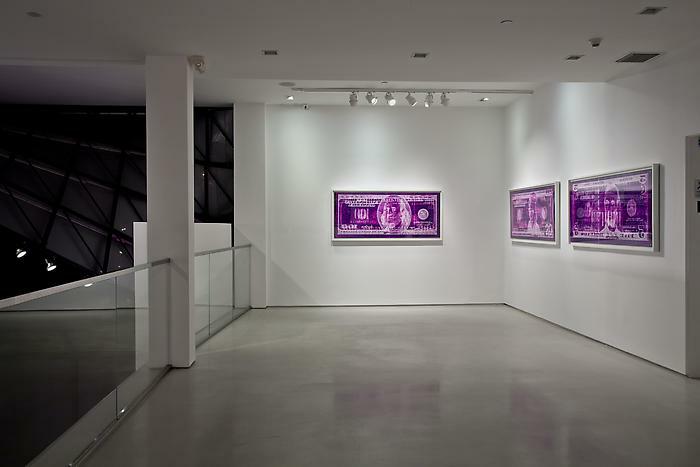 PRISM is pleased to announce the opening of David LaChapelle: Negative Currency also exhibiting Recollections in America, The opening reception will take place from 7-9 PM on Tuesday, September 27th, and will be on view through Saturday, November 5th. 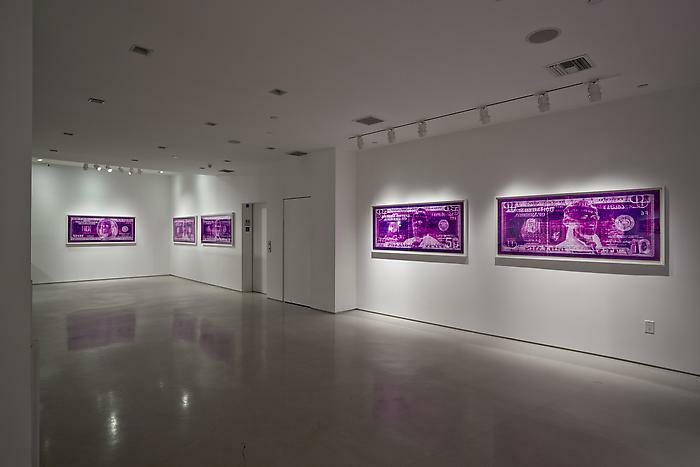 In the series Negative Currency, LaChapelle revives a developing process with which he had previously experimented in 1990. 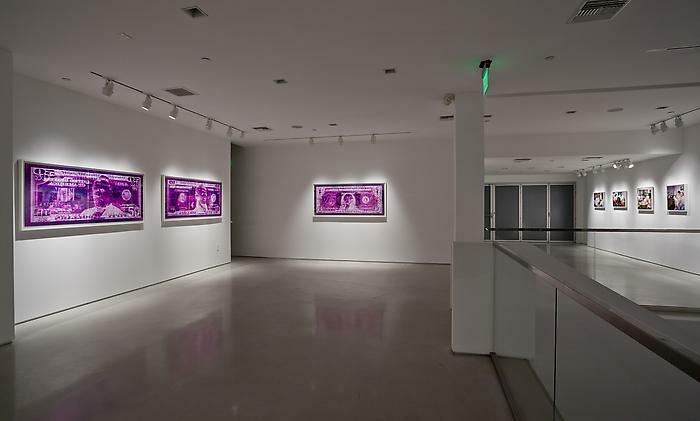 Using the enlarger in a darkroom, LaChapelle used dollar bills in the place of a negative, resulting in a pink print that simultaneously revealed both sides of the currency. 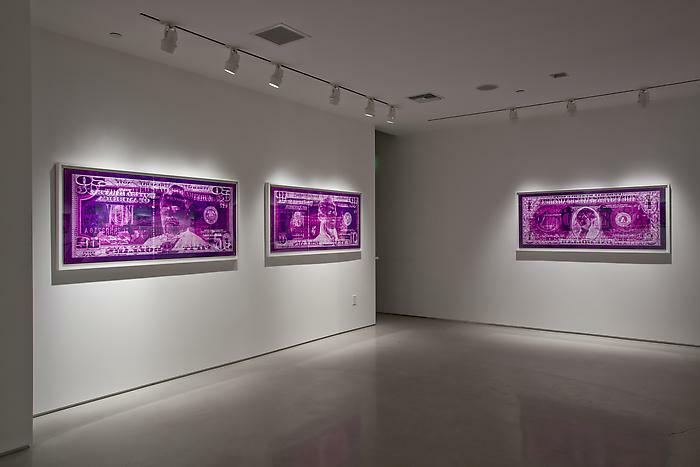 By rendering the image of the actual currency as a virtual negative, LaChapelle makes a direct correlation to the economic collapse based on artificial commodities and false capital. In his series, Recollections in America, LaChapelle recycled photographs that were bought second hand in order to compose a neo-collage. 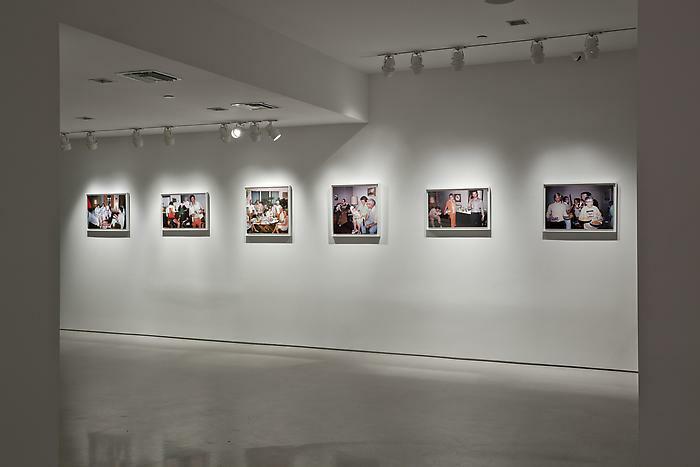 The original photos from the Seventies displayed groups of friends meeting up for family parties and other occasions. LaChapelle then manipulated these photos by inserting additional objects and people, who otherwise had nothing to do with the original photographs. Firearms, flags, signs of American power, and young men are inserted into scenes in which symbols of America and alcohol were already present, preventing the viewer from discerning the authentic images from the fraudulent. Through his photographs, LaChapelle underlines the contradictions of class during the era of the so-called “American Dream,” above all middle-class suburbia, a group who continually experienced conflicted feelings lingering between pacifism and interventionism. 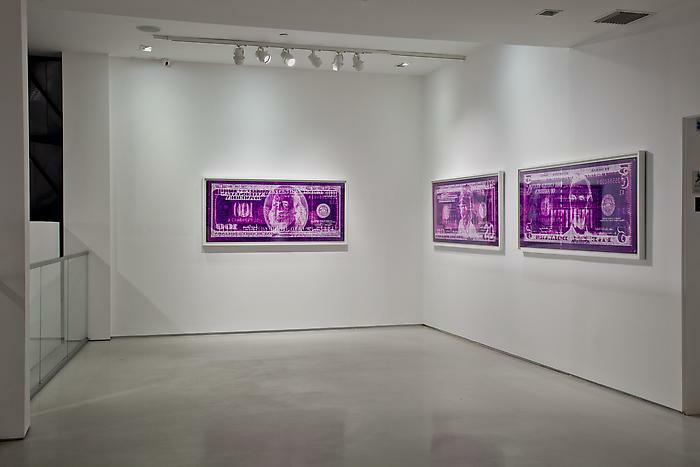 Seen as a whole, the works touch on the collective American consciousness, the charged nature of our current economic crisis and continuity between past and present created from analogies and inconsistencies. 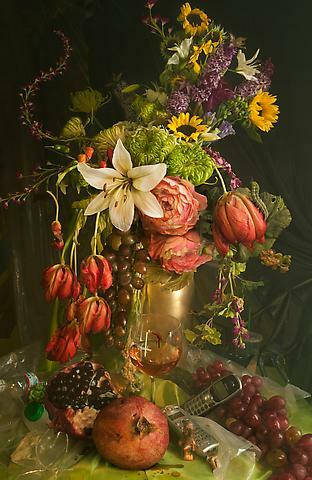 Recognized as one of the most versatile and original photographers working today, David LaChapelle attended the North Carolina School of Arts, after which his career quickly developed in New York in the 1980’s. 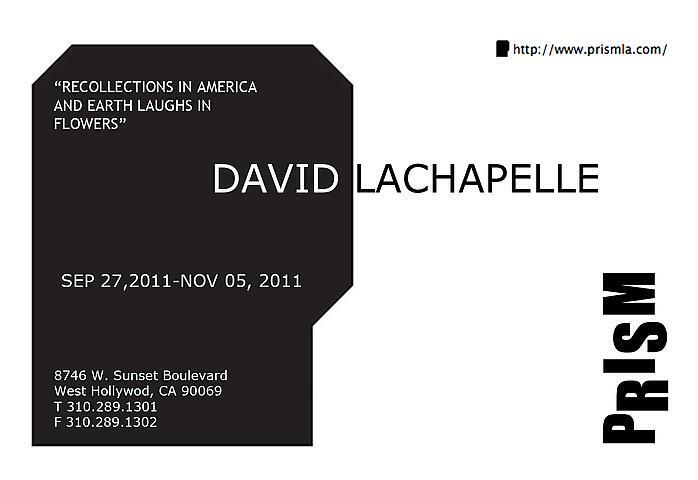 His mesmerizing images have appeared in magazines such as Italian Vogue, French Vogue, Vanity Fair, GQ, Rolling Stone and i-D. LaChapelle expanded his oeuvre to include direction of music videos, live theatrical events, and documentary film, leading to his development of the award-winning short documentary Krumped, from which he developed RIZE, the feature film that was subsequently distributed by Lion’s Gate Films. 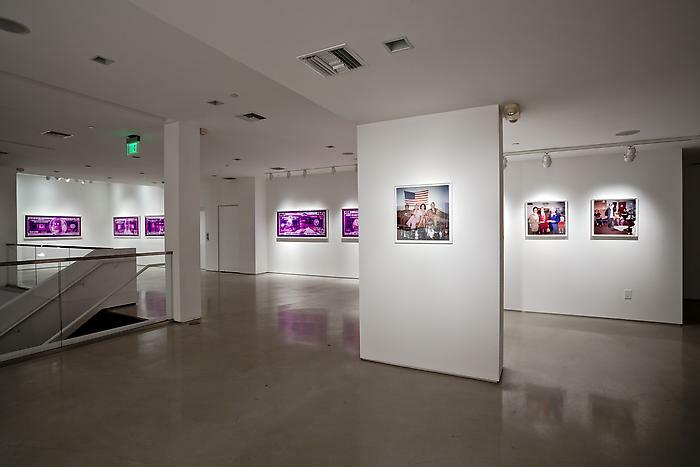 In 2010, LaChapelle mounted two record-breaking solo shows in the Museum of Contemporary Art in Taipei as well as the Tel Aviv Museum of Art. This is his first exhibition at PRISM.